Friday I flew out to Chico, CA. My morning started out bright and early in KC with a 5:45am flight, getting to Sacramento at 10am. Chico is another 1.5 hour drive north, so we arrived at the track just a little after noon. The AMain crew built a really great track and were watering regularly to have good racing conditions. Friday would be open practice for most the day, then have two rounds of controlled practice. The AMain Manufacturers World Cup featured a unique racing format as well. 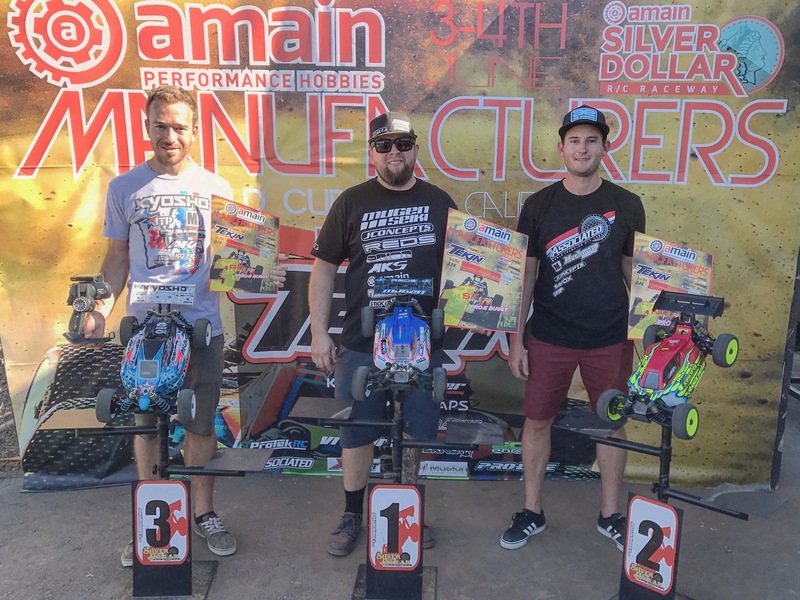 The open classes having a normal IFMAR qualifying and main event format, but the pro classes would feature a Reedy Race format. Each Pro class would feature four heads up races and take your best three scores. The Pro Electric Buggy races would be 9 minutes and the Pro Buggy and Pro Truggy races would be 14 minutes each. The starts were staggered a little, with three cars on each row, but it was almost a full motocross style start with how they did the staggering of the rows. 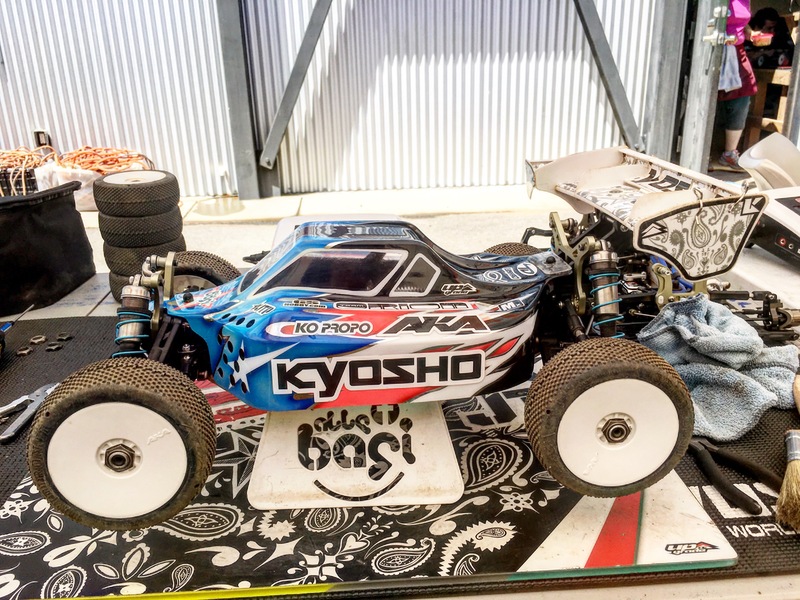 I brought my Kyosho MP9 TKI4 and MP9e TKI4, so I would only be racing the Buggy classes. Practice went pretty good, I was mainly focused on getting track time and getting back into the swing of things after my break I took. I tested a few things with gearing and speedo settings on my MP9e and then tested two different Front Ends on my MP9. Each run I seemed to get more comfortable and was driving better, by the end of practice, I was feeling pretty good. Saturday morning I got two really cool surprises when I showed up to the track. My Dad had driven up to come watch me race and also my Cousin. It has been quite a few years since I’ve seen my cousin, so that was really cool. 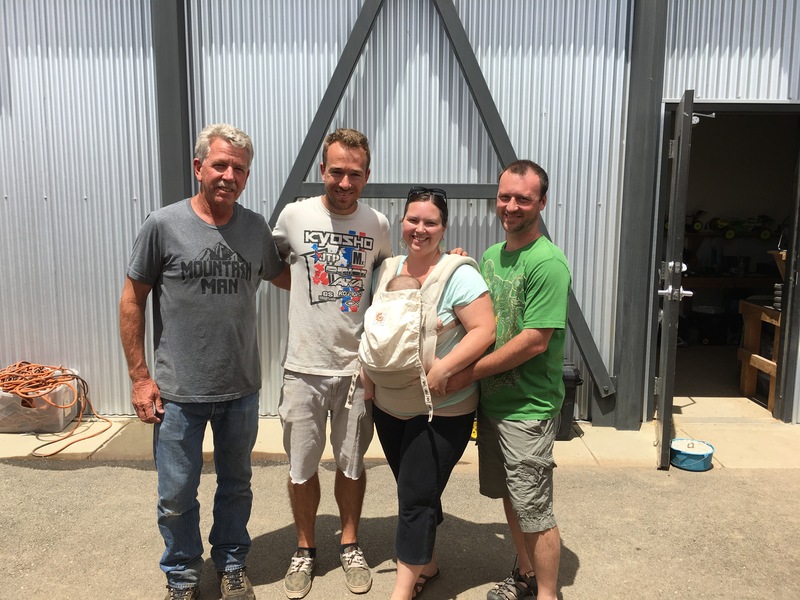 I also got to meet her first little girl, and she is only one day younger than my little guy Nash. I was ready to race and I would have four heads up races Saturday. Pro Electric Buggy would be up first for me, as I wasn’t racing Pro Truggy. Round 1 Pro Electric Start 5th : I got a good jump, but then would get hit from behind and sent flying into the outside fence in turn one. I got back on track and my car was feeling good, I was already starting to slice my way through some traffic and move forward. Just a few laps in though, my car would come to a stop … speedo failure. Round 1 Pro Nitro Start 7th : Just like the Electric race, I would get a bad start and be in the back after the first turn. The starts were crazy in these heats and I just wasn’t getting through clean. My pace was ok, but I started so far back, slowly working my way back up to 5th, where I would finish. Round 2 Pro Electric Start 7th : Really wanting to get a better start, I was trying to be patient and just get through, but again I was in a crash and came out of turn two in the back. We put in the Team Orion R8 Pro X speedo for the second round, so it took a little getting used to it, as I have ran the Team Orion R8.1 Pro all year. I was able to find my rhythm and get up to 4th. With the DNF in R1 and 4th in R2, I really needed great finishes on Sunday to battle for the podium. Round 2 Pro Nitro Start 3rd : I had my first front row start, but I would hit a car after the double going into turn two and get shuffled back some again. My car was good though and I fought back and locked into a hard battle with Adam Drake for 4th. I was much faster, but couldn’t get a clean pass. Adam was driving very defensive and blocking every move I tried to make. In the final minutes, Ryan Maifield would run out of fuel and our battle became a podium battle. Adam and I would tangle and Joe Bornhorst would join in for the final two laps. I held Joe off, but couldn’t pass Adam, finishing 3rd … first podium finish of the event, ending day 1 of racing on kinda a high note. 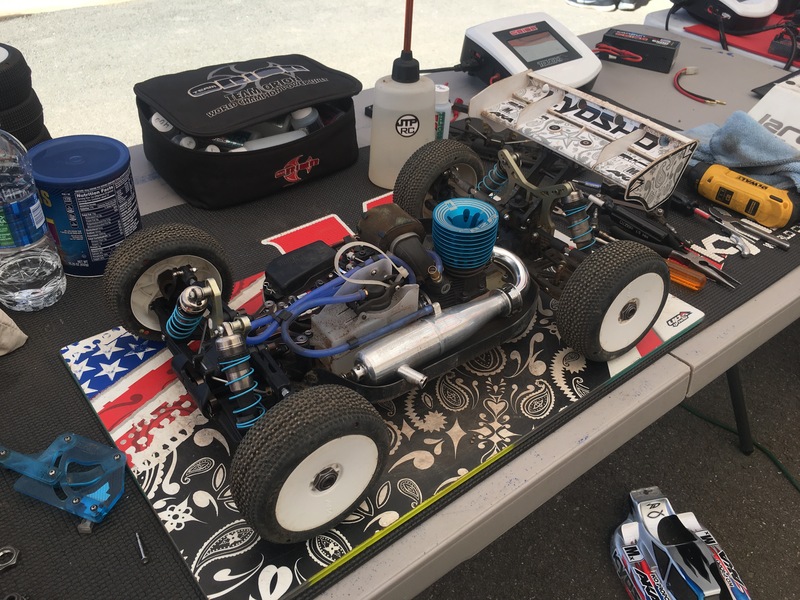 Round 3 Pro Electric Start 10th : I was pretty frustrated with how Day 1 went and I wanted to drive more aggressive and try to get some wins in. I was starting 10th, so my main goal was to get to the inside and be on the inside after the double, going into the 180 turn two. I jumped the double, in 10th place, but on the inside …. and there was a HUGE pileup. It was kinda a blur, but I think I landed on top of one car, bounced into another car, hit it, that car spun me 180 and then I just bounced off the front end and came out of turn two in 2nd! My car was feeling great, my AKA tires were gripping good, and I was really comfortable now with my new Team Orion speedo. I quickly passed into the lead, but I had Ryan Lutz and Adam Drake not too far behind. I drove clean and pulled a gap, but then crashed in the sweeper and let them catch up some. Pulled another gap as they were battling and took the win! Round 3 Pro Nitro Start 5th : This heat was pretty stacked as I had Cavalieri, Maifield, Lutz, and other fast drivers in it. I was able to get a great start and work myself into the lead after a couple of laps. I had a two second cushion over Maifield and the rest of the field after a few laps and was feeling great. Still leading as we entered the halfway mark, I would come into the pit lane to get fuel …. but someone jumped out and grabbed my car, thinking it was a different car. They dropped it back down and I got to my pit crew, got fueled, and still held the lead. Maifield was a little closer, but I was driving smooth and confident, ready to battle and fight for the win of the heat. Coming around the sweeper I would catch a small rut and flip, dropping down to 3rd. Just a few laps later, battling with Cavalieri and Lutz, I would bobble again over a tricky angled table top jump, going upside down and losing a TON of time, dropping to 5th. On the last lap I would battle hard with Alex K and we would both make a few passes on each other, but he would make the last pass. I went from feeling like I could take the win, to finishing a very disappointing 5th. Round 4 Pro Electric Start 1st : Just like in my Rd 3 Nitro, I would have most of the top Pro drivers in my heat. I started inside of row 1, which hasn’t really been great for a lot of drivers. I focused on the tone …. and got a great jump and held the lead. 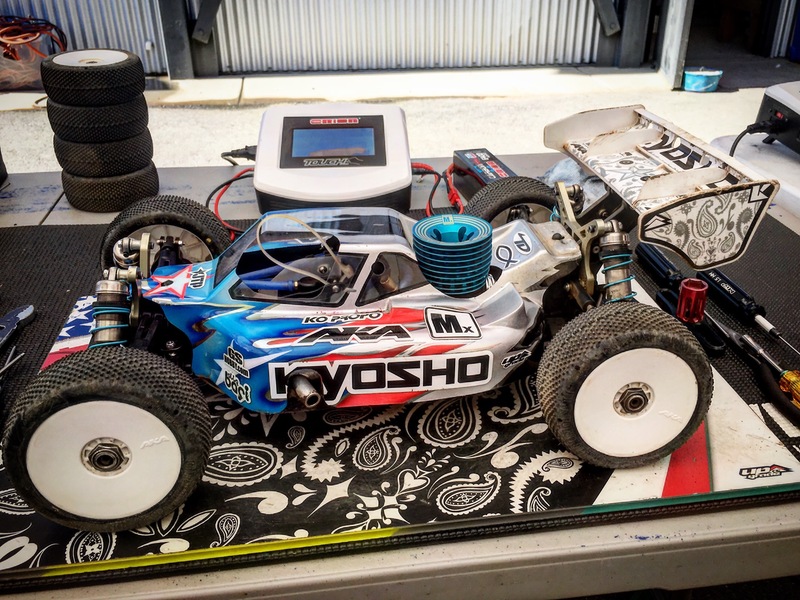 My Kyosho MP9e TKI4 felt great and I would lead every lap and take the win over Lutz and Maifield. With taking two wins on Sunday and my 4th on Saturday, I would squeeze into 3rd overall! Round 4 Pro Nitro Start 11th : Starting last on the last row, I would keep my Sunday streak of good starts alive and have another great start, exiting turn two in 2nd! I quickly moved into the lead and focused on clean laps. Ryan Lutz and Adam Drake were in 2nd and 3rd, but they couldn’t gain any ground and I kept my lead the whole race to finish off my day and the event with another win! My scores in Nitro were not that good though, 5/3/1 to take 6th overall. Really happy to win 3 out of 4 races on Sunday though! Thank to all my fans, my Dad and Joe Pillars for the pit help, my family, my sponsors Kyosho, MX, Team Orion, AKA, KO Propo, GS Hobby, JTP, Upgrade-RC, TD Paint, Lunsford, MIP, and the Good Lord Jesus Christ. Thanks for reading, and I will be at AMS in Alabama in just a few short days, ready to battle again! God Bless! Still getting my eBuggy suited to my liking, hopefully it’ll be ready for the eNats. As requested to share the love, all were given to those that needed them.